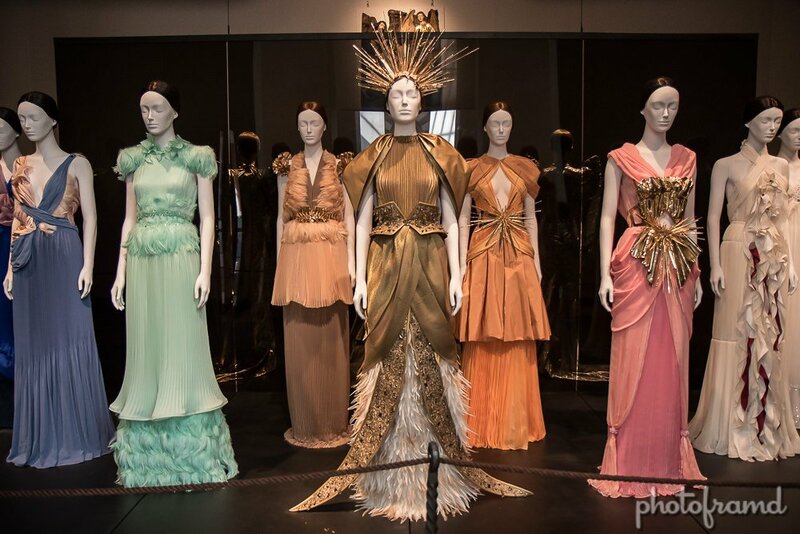 The Spring 2018 Exbibit for the Met’s Costume Institute is called Heavenly Bodies. This large exhibit is split between the Met’s Fifth Avenue Museum and The Cloisters. The exhibit focuses on the impact of Catholicism on Fashion and art. Although there are several items on loan from the Vatican, the real excitement is from designers like Gianni Versace, Cristobal Balenciaga, Domenico Dolce and Stefano Gabbana, John Galliano, Jean Paul Gaultier, Madame Grés, Christian Lacroix, Karl Lagerfeld, Jeanne Lanvin, Claire McCardell, Thierry Mugler, and Elsa Schiaparelli. The Fifth Avenue portion of Heavenly Bodies is set in the Met’s Byzantine & Medieval Galleries. It’s a shame the exbibit can’t be permanent. It is an exciting blend of Old World and modern interpretations.